The best time to introduce your new puppy to the world of humans, places and other animals is between four to twelve weeks. A puppy won’t leave her Mother until at least eight weeks old so as soon as you have her, begin the socialisation process. 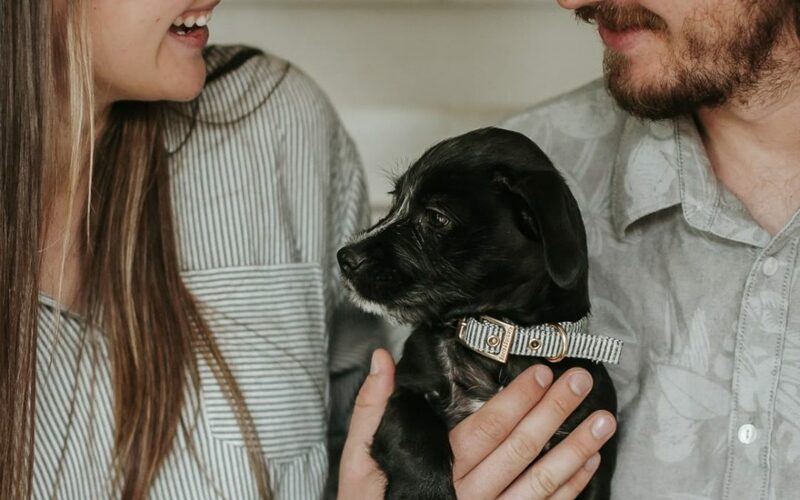 By slowly introducing her to new things every day, you will soon find that the shy little pup that you brought home will become an inquisitive happy dog. Here are 8 tips on how to socialise your new puppy without her even realising it! Enjoying This Post? Then save It To Pinterest! Your new puppy will have his first round of vaccination injections at around six weeks. Taking him to the vet is going to be his first experience of socialisation so let’s make it a positive one! We have all seen the dog who has to be dragged into the vets! Make sure your puppy feels relaxed at the vets by holding him, stroking him and letting him have a good smell and look around at his environment, this way, a trip to the vets will never be a big drama for your adult dog. After she has had her second vaccination (usually at around eight weeks old), your new puppy can go on daily walks. Make sure you buy her a well-fitting collar and lead specially designed for a puppy and keep the lead short for now until she has learned all of her basic training commands. Walking daily will become yours and your dogs favourite time of day. It is now that your new puppy can smell different smells, meet new dogs and hear unfamiliar sounds. When socialising your new puppy make sure that you mix things up a little. Don’t take her to the same park every day or the stretch of sand on the local beach; mix things up! As I mentioned above, it is very important to get your new puppy used o different modes of transport if you are wanting to be able to travel with her in the future. Cars, trains and buses are all great ways of getting your new puppy ready for the big wide world of adventures. Invest in a puppy crate so that your new member of the family is safe when travelling in the car. If you have kids make sure that they handle their new puppy frequently. Obviously, be sure to air caution around clumsy toddlers who want to squeeze their new toy as hard as they can! Let them brush her – this is a job that all gentle children enjoy. Having lots of family members pick up the new puppy is a fabulous way of getting her used to strangers and helping her to feel relaxed and confident in her socialisation. Same goes for if you are in a dog-friendly cafe, let people pet her. If you have to leave your adult dog with a dog sitter later in life this crucial part of the socialisation process will pay dividends. Whether you live on a farm, or you have a cat who resides down the street make sure that you introduce your new puppy to all of his new friends. We have 5 sheep and the first thing we did with our new puppy was to let her spend daily time with them. As an adult dog, she has never regarded the sheep as anything different than herself. Yes, the grumpy cat makes take a swipe at this new intruder, fear not. Let them become used to seeing each other and encourage them to be friends. If you feel as though you would like support, then now is the time to take your new pup to training classes. It is here that your pup will meet lots of new faces in a safe environment. Check out where the local puppy training classes are happening and take her along! Dogs are not robots, they have emotions and feelings just like you and I. If you can sense that your puppy is feeling tired and irritated, then take a break from the socialisation for the day and give him some down time to just be a puppy. Like children, puppies need time to be alone and reflect on everything they have experienced. Watch out for signs that your pup is letting you know he has had enough. The tail between the legs, yawning and excessive panting shows that your pup has had enough and it’s time to pick him up and put him on your knee for some quiet time. RELATED POST THAT YOU WILL ENJOY! 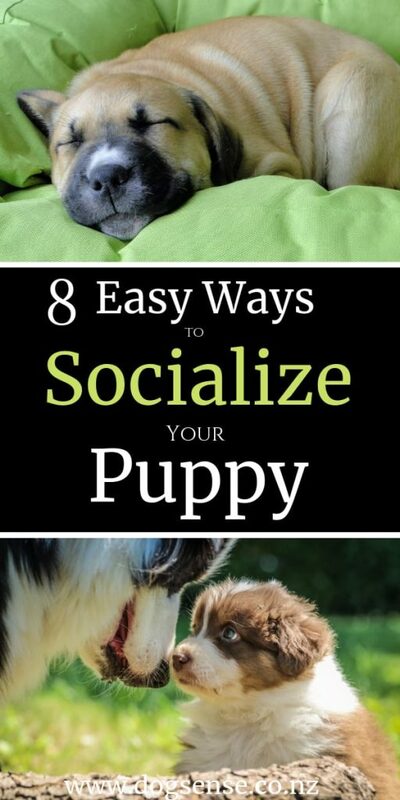 Socialising a new puppy is one of the most enjoyable and memorable bonding times that you will share with your pet. Enjoy it, take your time and be patient! Remember, the more you do, the more your puppy will become the socialised, happy dog you are looking for.